to the next costumer. 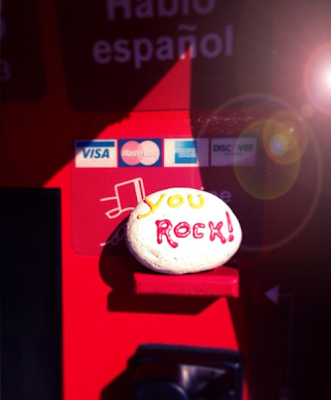 You rock! After six years of Word Rocks Project, I always get emails asking: How do I get started painting rocks? Or What are the best supplies? Here is another guide of some good supplies! I always struggle to write words with paint so markers became my best friends when painting rocks. I've tried a lot of them and these are some of my favorite. Poscas Pens are so far my favorite. Paint comes out easily, tips are resistant and perfect for details. They are a good option for a smooth, paint-like effect. Depending on your style you can choose fine or extra-fine point. The first time I spotted these spray chalk set at Target, my mind began to bubble with a thousand ideas. One of my "craft with a purpose" ideas is to chalk my driveway with cute designs or positive quotes for my neighbors. Needless to say, these chalk sprays would be perfect for this! As rainbows are one of my favorite "craft with a purpose" art, I decided to also include some butterflies to make it even cuter. I used Air Brainz stencil set that also comes with a turtle, a fox, and an owl. I made a cut in the center with the same measurements of the stencil and then sticking the butterfly with tape. Since the stencil is small, I needed to create a frame so the spray will not dye the surface around the butterfly as well. I used a styrofoam rectangle that came with some mail delivery. I made a cut in the center with the same measurements of the stencil and then stick the butterfly with tape. As a lot of peopel ask me about my favorite supplies, here are some of them. Click on the name's brand to find them in Amazon.